The happiness of every person solely on the desire to fight for it. Love, family and faith – these are the main incentives for the Kazakhs, giving strength to go on, it seems that there is no more strength. For happiness really need to fight to every day, lived together in the shower left a lot of warm memories. We were unable to pay the ransom demanded, the groom could openly steal darling. Also can do the groom, the parents of the potential bride was openly against the marriage. Today the ritual „bride kidnapping“ is almost not found. 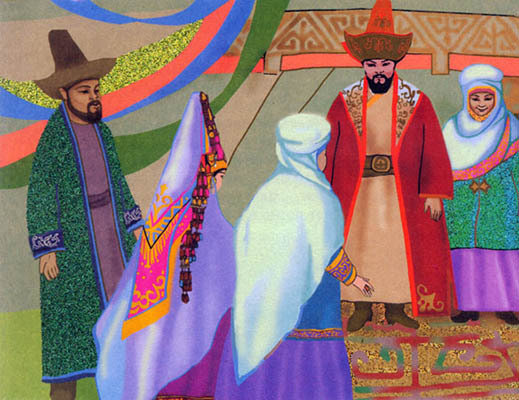 Speaking of the wedding ceremony in Kazakhstan, it is necessary to start with the most common tradition – Kazakh people are very monogamous. 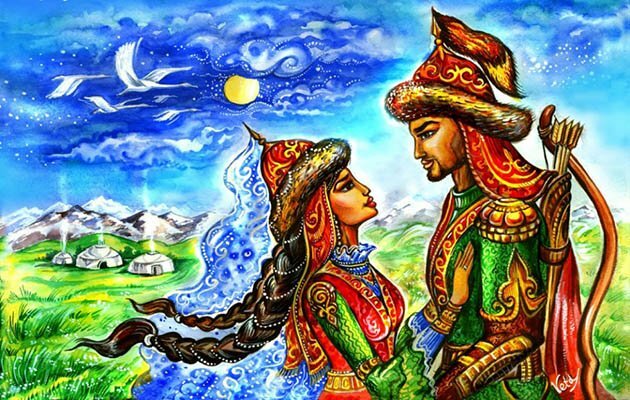 Unlike other Eastern peoples, the Kazakhs do not marry people if they are made in the relationship, less than 7 knee. 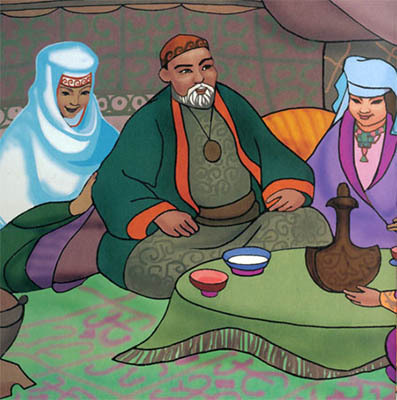 In this regard, Kazakhstan has a special saying – „those who live closer than seven rivers“. Also, under the strict prohibition of marriage with the fall of the same genus. All this should ensure the health of the Kazakh nation. Reputation kind and family . For many centuries, very early barge were widespread in Kazakhstan. 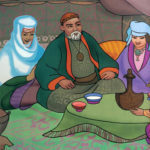 For example, learning the bride and groom could happen at the age of thirteen or fourteen.There have been cases when the future groom’s family a bride abducted from home, but the desire to obtain official permission to marry peacefully prevailed. The day, which was previously the stipulated advance relatives of the bride and groom, the relatives come into the house of the bride’s son. 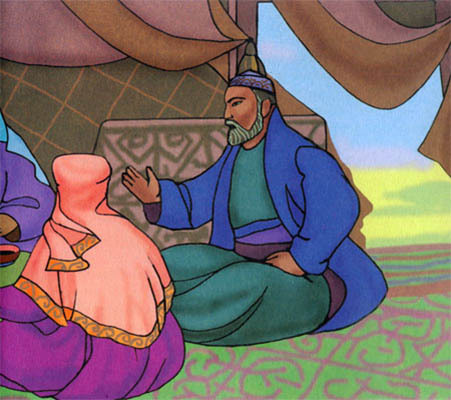 The house held lengthy negotiations, the results of which set the size of bride price. As a rule, the size of dowry is entirely based on the level of material wealth the groom’s parents. For example, relatives of the bride could ask for from 17 to 77 head of cattle as a ransom. If the groom’s relatives had no horses, they could pay ransom other kinds of cattle, or money that has gained much popularity today. The official day of the wedding the groom’s relatives have the right to appoint only if they pay more than half the dowry. Yes, many are outraged such draconian price and dowry, which was supposed to give. However, there is a certain cunning. Everything was going to the dowry the groom’s mother and father, but also all the relatives up to 7 of the knee. Since all the devotees who will be able to collect, will remain in the family, no one even hinted that a wedding ceremony requires too much money. At a certain day pass Kazakh bride – the ceremony, which provides the official introduction of the bride and groom. On that day, the girl should give their parents elect a white scarf symbolizing purity and faithfulness. If for any reason the groom or the bride refused to marry, they have to pay a substantial fine family of the bride or groom respectively. 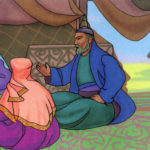 Tale about removing the veil . During the wedding ceremony the couple are not allowed to talk to each other. 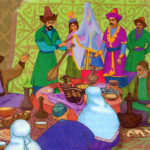 In Kazakhstan, it is considered bad sign if the ceremony was administered in February or January. 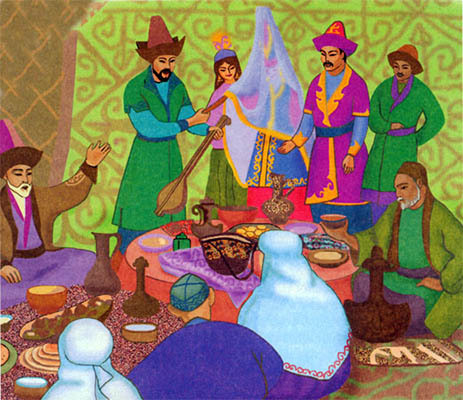 This tradition has remained even with those distant times, when Kazakhs were nomads, consider these two months is too heavy. Decoration of any wedding ceremony is not only tradition, but also the costumes. The most expensive and luxurious wedding element is the parent of the bride dress, called saukele. Make a hat out of velvet very expensive, followed by decoration of precious or semi-precious stones, velor, beads and so on. A mandatory attribute is saukele traditional ermine and mink. Ends wedding hat feather owl. 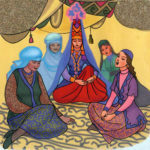 Traditional Kazakh bride always was decorated with a variety of embroidery, as a talisman with the bride and the whole family from harm. When the young man went for his future wife, he also carefully selected the appropriate occasion clothes. It was considered normal when the groom dress style in harmony with the style of the bride, while remaining completely different from the style of the classic horseman. Most often the bride wore boots with high heels, national headdress, ornaments made of feathers owl, a traditional embroidered robe chopon. 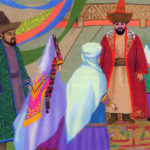 After complying with all formalities and traditions of Kazakh wedding is nearing completion. Now the couple are left alone to have the next morning to begin a completely different life, full of new fence and achievements. The day they have to go for the next calendar month to visit older relatives to express their respect.